Spectacularly attired in a bold new suit, Tony runs into Poppy (Karen Morley), his boss’s platinum blonde moll, who is getting a little warmer to Tony’s form after his repeated attempts at seduction. Poppy: You sure are a funny mixture, Tony. Tony: That’s the first time you’ve smiled. Tony: How do you mean you think I’m funny? Poppy: You just are, that’s all. Does this exchange seem familiar? 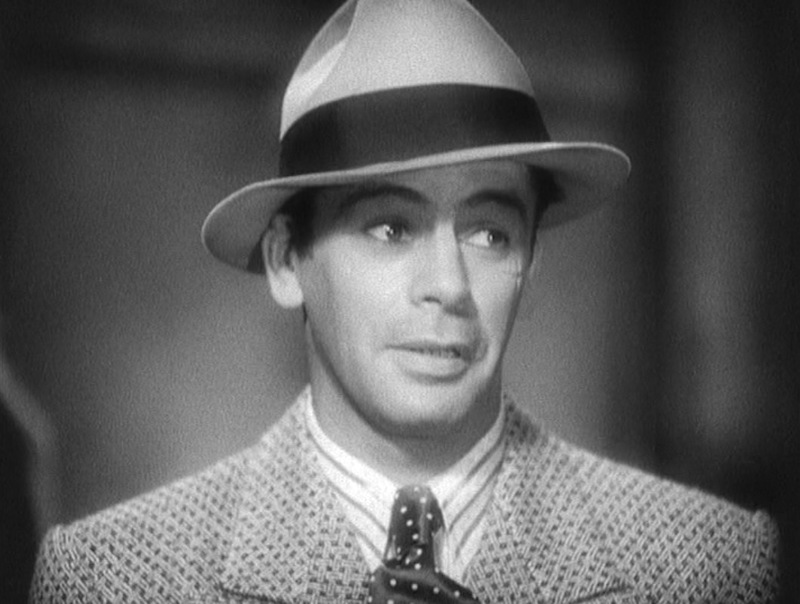 Tony Camonte makes quite an impression on Poppy – and the audience – when he struts into his gang headquarters sporting a snazzy double-breasted three-piece suit in a fancy “basketweave check” suiting… in this case, “basketweave” refers to the pattern of the suiting rather than the actual woven fabric. From a distance, the suiting looks more like a field of dark lozenges against a light-colored ground, but a closer look reveals the unique interconnected pattern. The unique suit parallels Tony’s unique rise through the underworld, disobeying orders and protocol just as he eschews traditional standards of “tasteful” dress. The distinction is made especially clear as the brash Tony is forced to defend his rash decisions to his exasperated boss, Johnny Lovo (Osgood Perkins). 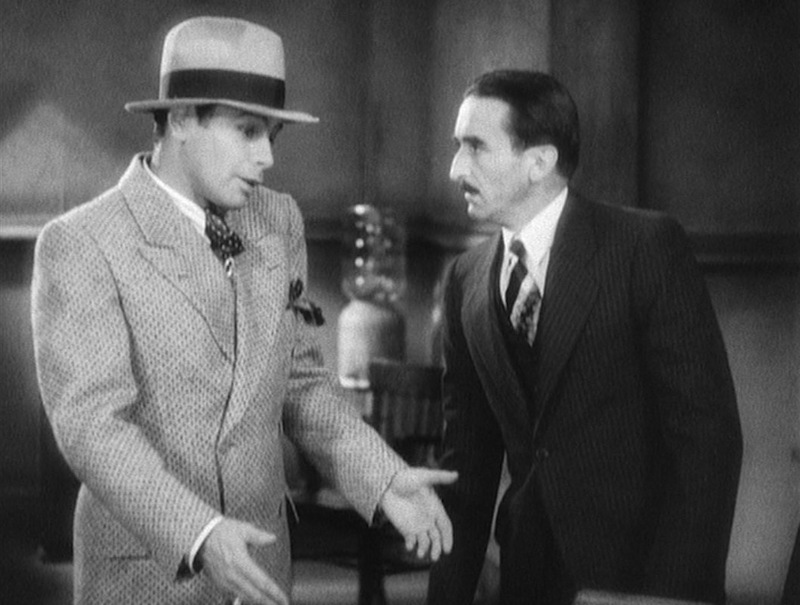 The tactful if overly cautious Lovo is dressed in a subdued dark pinstripe three-piece suit, plain white shirt, and striped tie, a standard look for the typical American businessman through the 20th century, the total opposite of Tony’s frantic suit, striped shirt, and sparkling diamond tie tack. The gangster and the businessman: The brash Tony Camonte’s loud clothing reflects his impulsive decisions while his boss Johnny Lovo channels the look and tact of a traditional businessman. 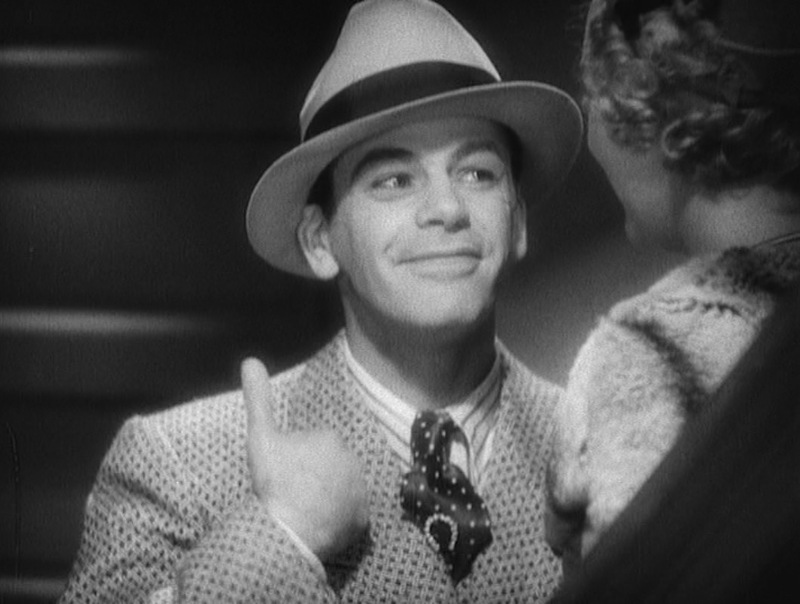 Now that Tony is on the fast track to power and success, he wears exclusively double-breasted suits from this point forward; even his black dinner jacket is double-breasted per a newly popular style of black tie dress in the early 1930s. 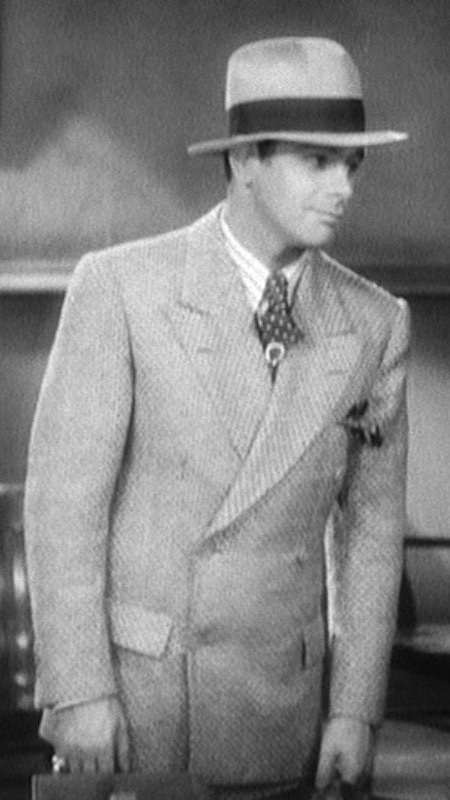 This double-breasted suit jacket has a six-on-two (6×2) button front that he keeps fastened at all times, with an era-consistent full wrap that covers most of his torso and all but the very top of the suit’s matching single-breasted waistcoat. The full-bellied peak lapels have long, straight gorges and a buttonhole through each side. The shoulders are padded and structured with roped sleeveheads, and the back is ventless. The flapped hip pockets are straight in line with the lowest row of buttons, and the welted breast pocket is embellished with a dark printed silk kerchief that is rakishly flopping out. Tony Camonte swaggers into the office, checking in with his associates before facing the music from his boss. We’ve all been there. Assuming that this suit is styled like his other three-piece suit – a solid dark suit worn for the film’s finale – the waistcoat (vest) has six buttons and a notched bottom, and the flat front trousers have side pockets and belt loops where he wears a dark leather belt with a flat buckle. 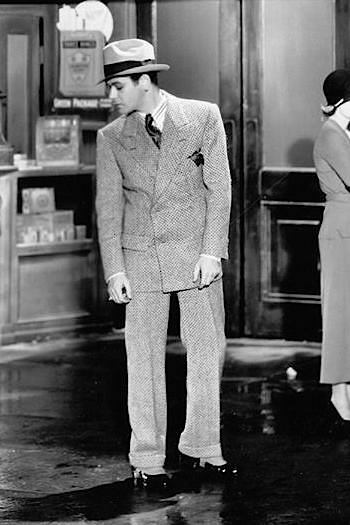 The trouser bottoms are finished with turn-ups (cuffs) that drape over the top of his spats. “Spats” is a shortened colloquialism for spatterdashes (or spatter guards), which were a cloth cover that buttoned around the ankles of men’s and women’s shoes to protect them from the elements. Most popular from the late Victorian era through the early 1920s, spats have been out of fashion in all but the most old-fashioned or formal contexts for nearly a century. Their most immediate pop culture reference is from Some Like It Hot where Muni’s Scarface co-star George Raft parodied his own gangster image by playing the ruthless coin-flipping mob boss “Spats” Colombo. In their infinite wisdom, the vintage-minded outfitters at Historical Emporium offer spats in a variety of styles. Beginning with this sequence, Tony Camonte wears light button-side spats over black patent leather shoes with all of his double-breasted lounge suits. 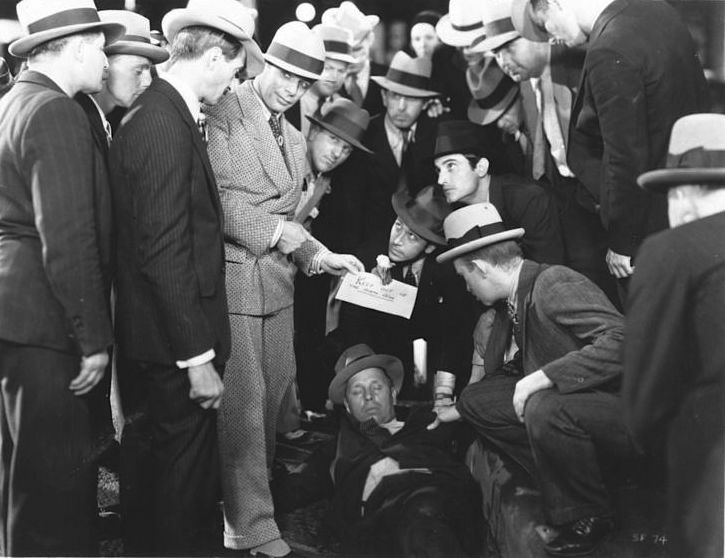 Promotional image of Tony and his crew discovering the corpse of a fellow gang member. Tony’s spats protect those patent leather shoes of his against the dirty street. Tony wears one of his new dress shirts with bold dark stripes on a white ground. The shirt has a large point collar with moderate tie space, a front placket, and single-button rounded cuffs. He would later wear this same shirt with his more subdued pinstripe double-breasted suit after Poppy’s visit… despite sharing with her his plan to wear shirts only once. Tony wears a dark silk tie with white polka dots, adorned with a diamond-studded pin in the shape of a horseshoe, echoing the diamond stickpins known to be worn by the real Al Capone of whom Tony Camonte is a thinly veiled cinematic surrogate. He wears the tie pin only a few inches below his tie knot so that it remains visible above his high-fastening vest. Dazzled by Tony’s diamond-studded stickpin and pinky shiner only inches away from each other, Poppy can’t help but to deadpan: “I see you’re goin’ in for jewelry. Kind of effeminate, isn’t it?” Tony, hardly the most adept commander of the English language, interprets this as a compliment – “Huh? Yeah! I got ’em at an auction. A bargain!” – which he punctuates by blowing on his ring and rubbing against his suit lapel to shine it. Tony tops off the look with a light-colored felt fedora with a dark grosgrain band and a slightly recessed pinched crown. Tony Camonte shows his wild side when dressing to impress, outfitting himself in a trifecta of patterns that’s so brash he doesn’t even care if there’s clash. Check out the movie or the Deluxe Gift Set which offers both the 1932 and 1983 versions as well as collectible lobby cards and featurettes on both discs. 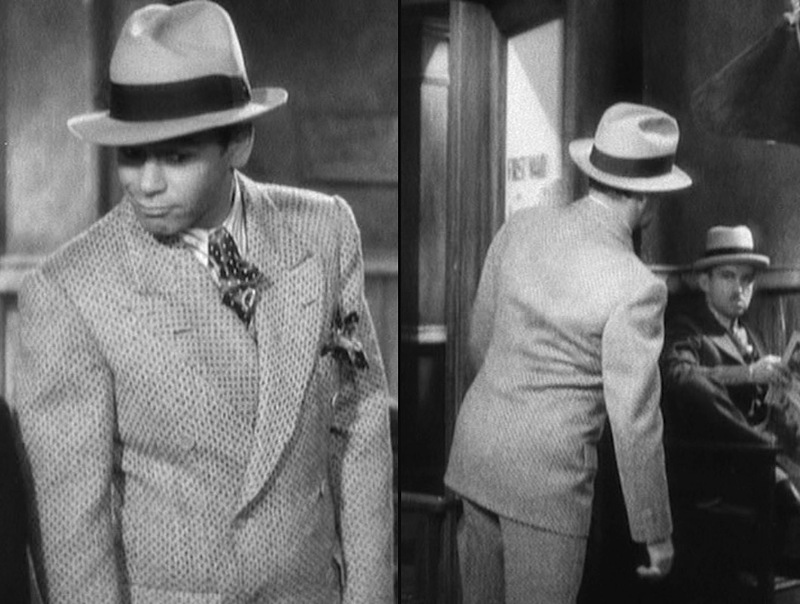 If you subscribe to The Chap, the winter 2017 issue is coming out today and features an article I penned about the role of suits and style in early 1930s gangster cinema with this suit specifically mentioned. Ah, he ain’t so tough… hanging out in a flower shop. You afraid of a guy like that? 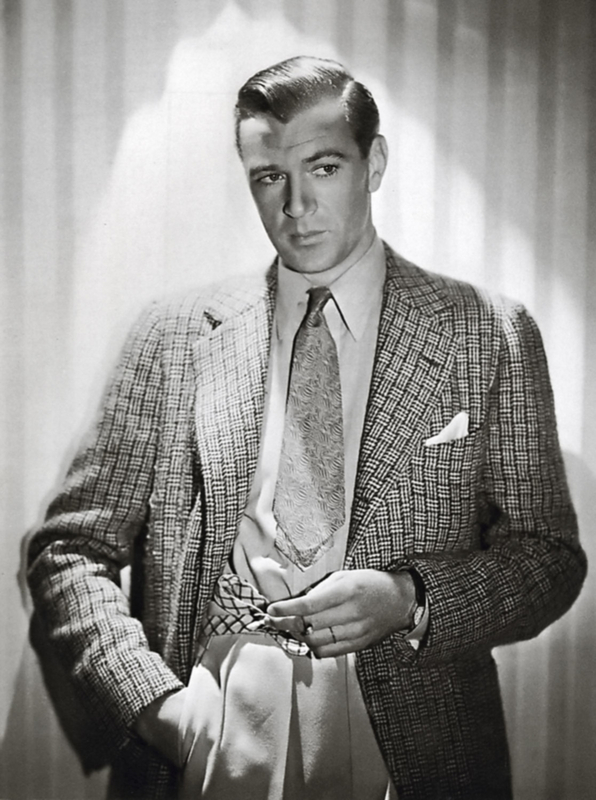 A somewhat larger scaled example of basketweave-patterned suiting can be found on Gary Cooper’s jacket in this photo, circa 1937. Good to know that one can still obtain spats, should the need arise. Thanks as always for an interesting article.